In September 2009, Shkreli started his own business. He launched MSMB Capital Management, which took its name from the initials of the two founding portfolio managers, Shkreli and his childhood friend, Marek Biestek. In 2011, Shkreli filed requests with the FDA to reject a new cancer diagnostic device from Navidea Biopharmaceuticals and an inhalable insulin therapy from MannKind Corporation while publicly short-selling both companies’ stocks, the values of which dropped after Shkreli’s interventions. The companies had difficulty launching the products as a result, although the FDA ultimately approved both. Retrophin’s 2015 SEC Complaint contended Shkreli had created MSMB Healthcare and Retrophin “so that he could continue trading after MSMB Capital became insolvent and to create an asset that he might be able to use to placate his MSMB Capital investors. Shkreli founded Turing Pharmaceuticals in February 2015, after his departure from Retrophin. He launched Turing with three drugs in development acquired from Retrophin: an intranasal version of ketamine for depression, an intranasal version of oxytocin, and Vecamyl for hypertension. Shkreli set a business strategy for Turing: to obtain licenses on out-of-patent medicines and reevaluate the pricing of each in pursuit of windfall profits for the new company, without the need to develop and bring its own drugs to market.As markets for out-of-patent drugs are often small, and obtaining regulatory approval to manufacture a generic version is expensive, Turing calculated that with closed distribution for the product and no competition, it could set high prices. On August 10, 2015, in accordance with Shkreli’s business plan, Turing acquired Daraprim (pyrimethamine), a medication approved by the FDA in 1953, from Impax Laboratories for US$55 million. The drug’s most prominent use as of late 2015 was as an anti-malarial and an antiparasitic, in conjunction with leucovorin and sulfadiazine to treat patients with AIDS-related and AIDS-unrelated toxoplasmosis. On September 17, 2015, Dave Muoio of Healio, an in-depth clinical information website for health care specialists, reported on a letter from the Infectious Diseases Society of America and the HIV Medicine Association to executives at Turing, questioning a new pricing for Daraprim. The price of a dose of the drug in the U.S. market increased from US$13.50 to US$750 per pill, overnight, a factor of 56. The price increase was initially criticized, jointly, by the Infectious Diseases Society of America and the HIV Medicine Association, by the Pharmaceutical Research and Manufacturers of America, and soon thereafter by presidential candidates Hillary Clinton, Bernie Sanders, and Donald Trump. A subsequent organized effort called on Turing to return pricing to pre-September levels and to address several matters relating to the needs of patients, an effort that garnered endorsements from more than 160 medical‑specialty and patient‑related organizations (as of December 2015, 164 organizations from thirty-one states, the District of Columbia, and Puerto Rico). In a September 2015 interview with Bloomberg Markets, Shkreli claimed that despite the price increase, patient co-pays would actually be lower, that many patients would get the drug at no cost, that Turing had expanded its free drug program, and that it sold half of its drugs for one dollar. He defended the price hike by saying, “If there was a company that was selling an Aston Martin at the price of a bicycle, and we buy that company and we ask to charge Toyota prices, I don’t think that that should be a crime.” A few days later, Shkreli announced that he planned to lower the price by an unspecified amount, “in response to the anger that was felt by people”. But in late November, Turing reversed course and said it would not lower the price after all. Following a request by Senator Bernie Sanders and Representative Elijah Cummings for details of Turing Pharmaceuticals’ finances and price-setting practices in September 2015, the company hired four lobbyists from Buchanan, Ingersoll & Rooney with backgrounds in health care legislation and pharmaceutical pricing. In addition to lobbyists, Shkreli hired a crisis public relations firm to help explain the pricing decision. On October 22, 2015, Mark L. Baum, CEO of Imprimis Pharmaceuticals, announced that his company would provide a combination product containing pyrimethamine (the active ingredient in Daraprim) and leucovorin at “$1-a-pill” as a cheaper and more efficient alternative to Daraprim. This product is intended to be used alongside sulfadiazine in the standard protocol to treat toxoplasmosis typically seen in AIDS patients. Baum noted, “This is not the first time a sole supply generic drug – especially one that has been approved for use as long as Daraprim – has had its price increased suddenly and to a level that may make it unaffordable”. He announced the availability of the compounded replacement for Daraprim as a part of a larger corporate program, “Imprimis Cares”, to make “novel and customizable medicines available to physicians and patients at accessible prices”. Imprimis is now offering its compounded, orally taken formulations of pyrimethamine and leucovorin beginning at US$99 for a 100‑count bottle, essentially a dollar a dose. On November 23, 2015, Turing announced that the company would not reduce the list price of Daraprim, but said it planned instead to negotiate volume discounts of up to 50% for hospitals. Turing issued a statement that it was not as important to cut the list price as to reduce the cost to hospitals, where most patients get their initial treatment. The company pledged that no patient needing Daraprim would ever be denied access. Infectious disease specialists and patient advocates, including Tim Horn of the Treatment Action Group and Carlos del Rio of the HIV Medicine Association, said Turing’s actions were insufficient, given that patients initially treated for days at a hospital typically have to continue the treatment for weeks or months after leaving. In November 2015, an investor group led by Shkreli acquired a majority stake in KaloBios Pharmaceuticals (OTC Pink Limited: KBIOQ), a biopharmaceutical company based in South San Francisco, California. 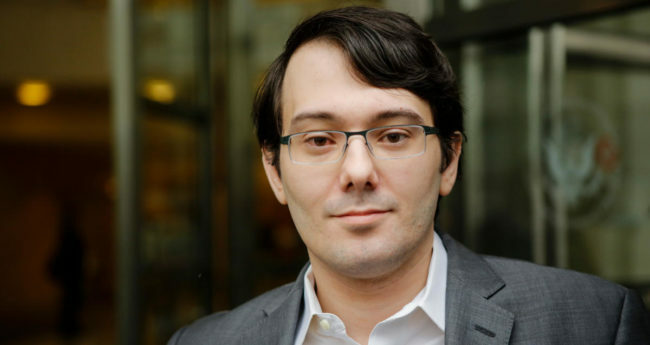 Shkreli was named CEO of the company and also planned to continue in the role of CEO of Turing Pharmaceuticals. After his December 2015 arrest, KaloBios Pharmaceuticals terminated him as CEO. On December 29, 2015, KaloBios filed for Chapter 11 bankruptcy. This followed NASDAQ delisting its shares, and the resignation of two directors. On December 17, 2015, Shkreli was arrested by the FBI after a federal indictment in the U.S. District Court for the Eastern District of New York was filed, charging him with securities fraud. The charges were filed after an investigation into his tenure at MSMB Capital Management and Retrophin. He was accused of running a Ponzi-like scheme. Federal prosecutors said that Shkreli “engaged in multiple schemes to ensnare investors through a web of lies and deceit”. In an interview with The Wall Street Journal, Shkreli said that he was targeted by law enforcement for his price hikes of the drug Daraprim and his flamboyant personality. Karl Erivan Haub (born March 5, 1960) Schumacher Effect ?